Bittele Electronics offers IC programming service at our state of the art PCB Assembly facility. In order to maintain high efficiency for our Complete PCB Assembly services, IC programming will be performed concurrently with PCB Fabrication, before the chips are mounted on the board. 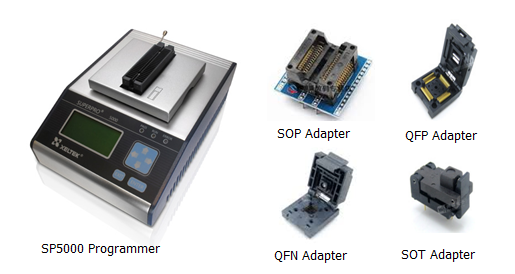 We support various package types, including: DIP, SDIP, SOP, MSOP, QSOP, SSOP, TSOP, TSSOP, PLCC, QFP, QFN, MLP, MLF, BGA, CSP, SOT and DFN. We employ a powerful programming device called the SuperPro-5000 from Xeltek Inc. It is a professional universal programmer that is capable of programming more than 81,000 devices, with 144 built in universal pin-drivers. With independent socket adapters, it can also support: MCU/MPU, EPROM, EEPROM, FLASH, Nand Flash, PLD/CPLD, SD Card, TF Card, CF Card, eMMC Card, eMMC, MoviNand and OneNand. We accept the following file formats: Binary, Intel Hex, Motorola S-Records, Tektronix, Extended Tektronix and POF. We can follow your required settings, configurations and the checksum provided to make sure all programming is done properly. Our meticulous Quality Management system, coupled with our Functional Circuit Testing (FCT) service will ensure that your software-driven project works exactly as intended every time. We also offer In-Circuit Serial Programming (ICSP) services and label printing, packaging and shipping services to go beyond your expectations.